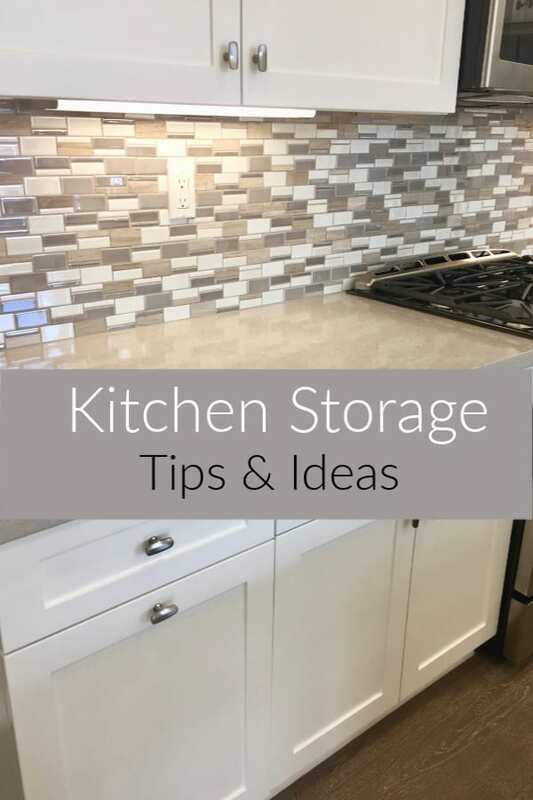 Kitchen storage tips to maximize space and utilize your kitchen efficiently. This post contains affiliate links. See my full disclosure policy here. With a new year, typically comes a desire to be more organized. 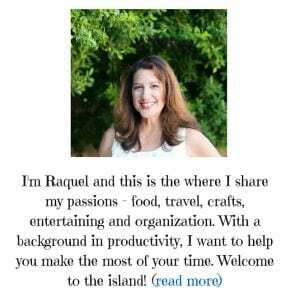 Many of you have stated that kitchen organization can be a challenge, and I totally agree. Because we now have a (much) smaller area, kitchen organization is absolutely essential to my home life (and well-being)! 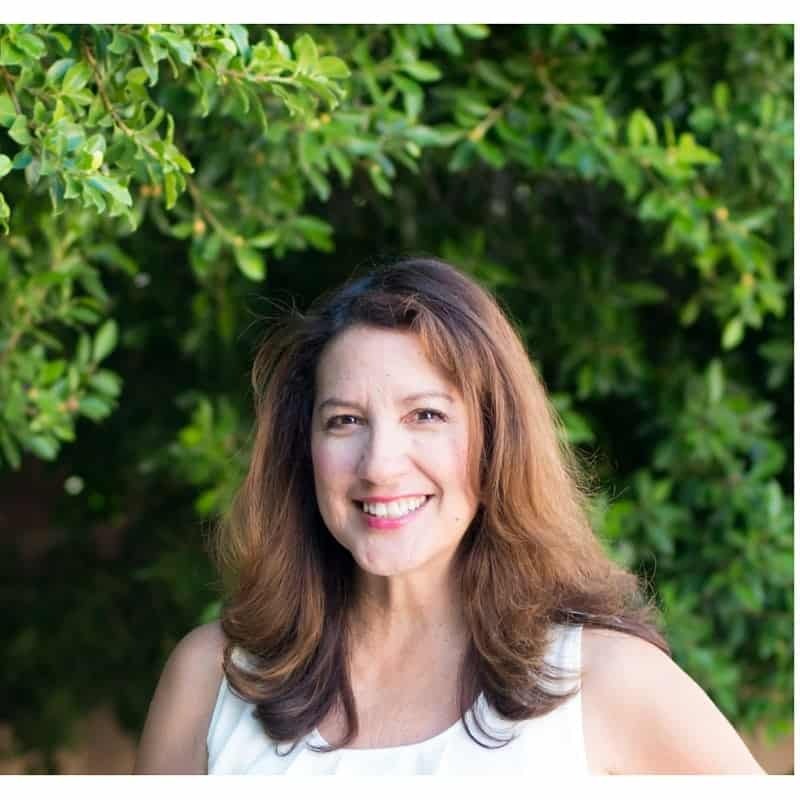 I thought I would share a few tips that work for me that help keep my kitchen effective and manageable. Keep like items are together. Think about where you use certain things and keep similar and complementary items together. We have a coffee zone in our house because coffee is a very important beverage in our house. 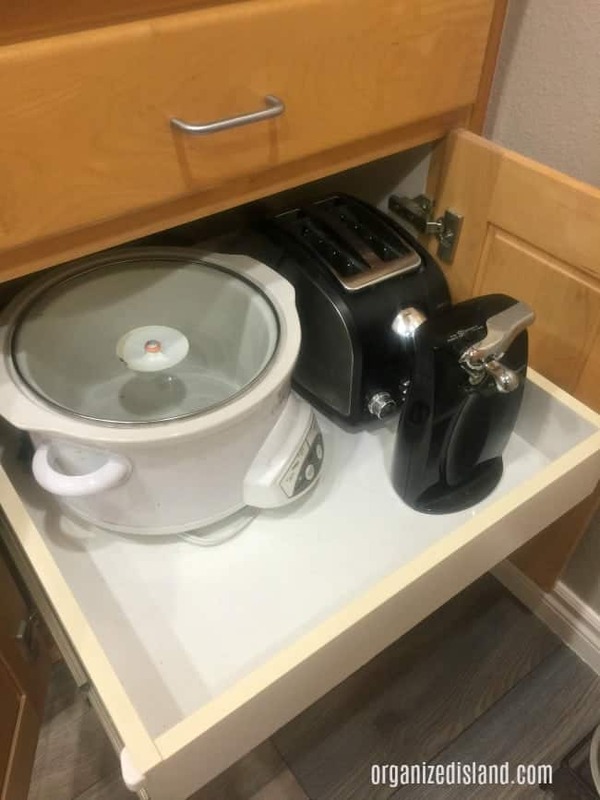 All of my baking items are near my oven so that they are all within easy reach when I get that hankering for cookies or cupcakes. Think about the way you use certain appliances and what makes sense to be close to them. Think upward and sideways and maximize each space. Look at your cabinet. Is there a lot of empty space above things? If you can find a system that has some height to it, you can really maximize your storage space. 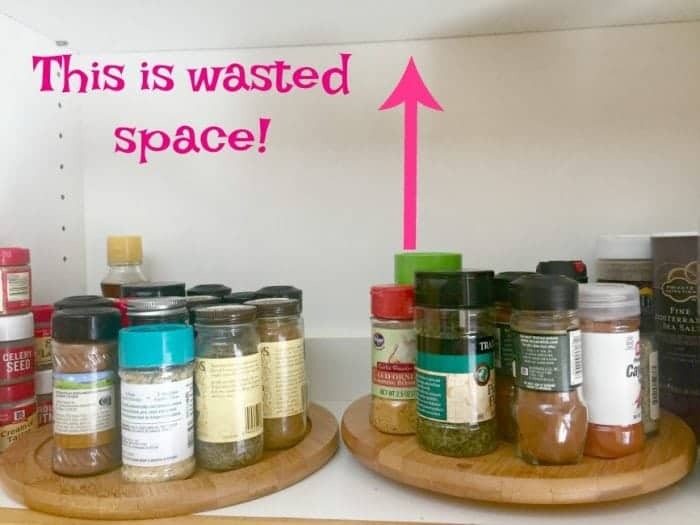 This vertical spice jar holder took far less room than having the bottles in front of each other. I can also see the items more easily! Can you add a shelf or use the space for hooks to store other items? Pull out drawers are super helpful for use as are pull out shelves. This is pretty important. About every six months, I take things out of the cupboards and look for expired or questionable items. If something has been opened or has changed color, I get rid of it.If something is about to expire soon, I will move it to the front so that the money is not wasted. I have a few kitchen appliances that I only use a couple time of year. Because of their infrequent use, I store them in another room in their original boxes. The prime space in my kitchen is reserved for more frequently used housewares. If you have an item that you haven’t used in the last few years, I would suggest donating it or giving it to a family member, unless it has great sentimental value and cannot be replaced. Think outside of the (storage) box. 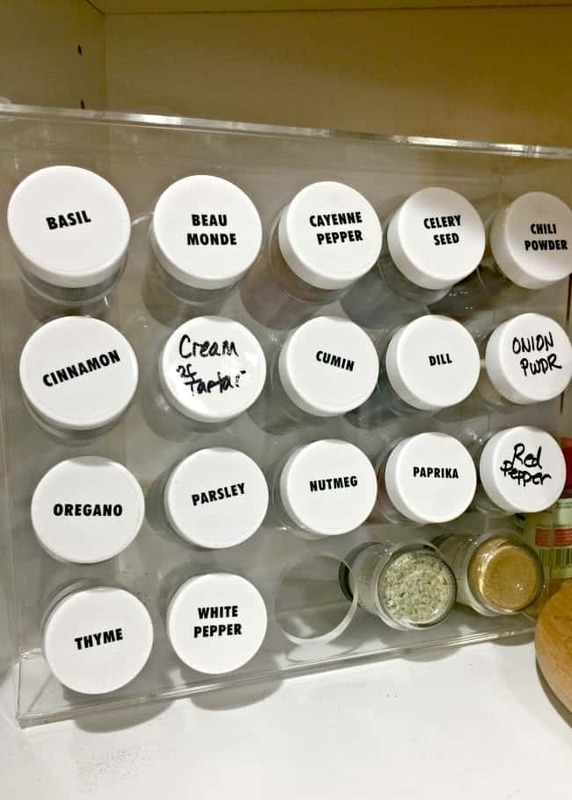 Use elevated packet storage boxes (#1) for spice blends. 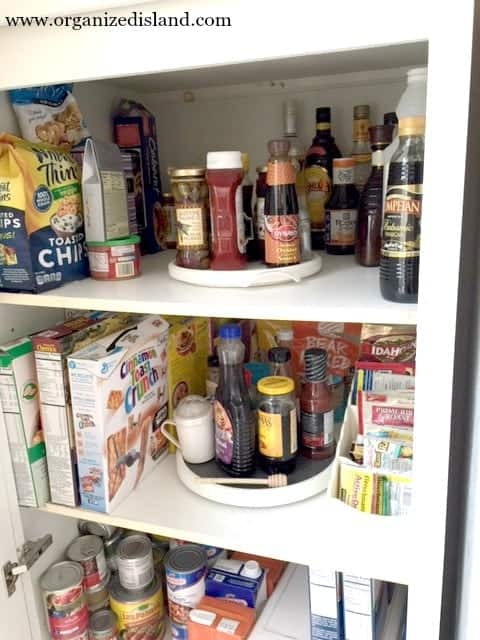 Lazy Susans (#2) are great for ensuring you can see what is on the shelf. Mason jars make great food storage because you can see what is in them. They also clean up well and come with a tight seal. (#3) Stackable plastic drawers are great for bags of beans, chocolate chips and spaghetti. Finding systems that work for households depend on your lifestyle and budget. I went from having a big kitchen to one that is about a quarter of the size of the previous one but I happily took the challenge. I can honestly say I can find all of my gadgets and appliances easily. 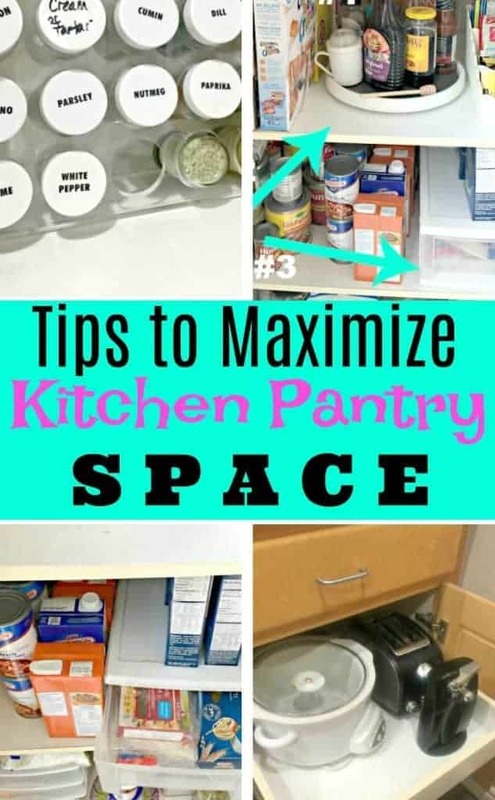 It took moving a few thing around to find the optimal kitchen set up but once you do, it will make a big difference. 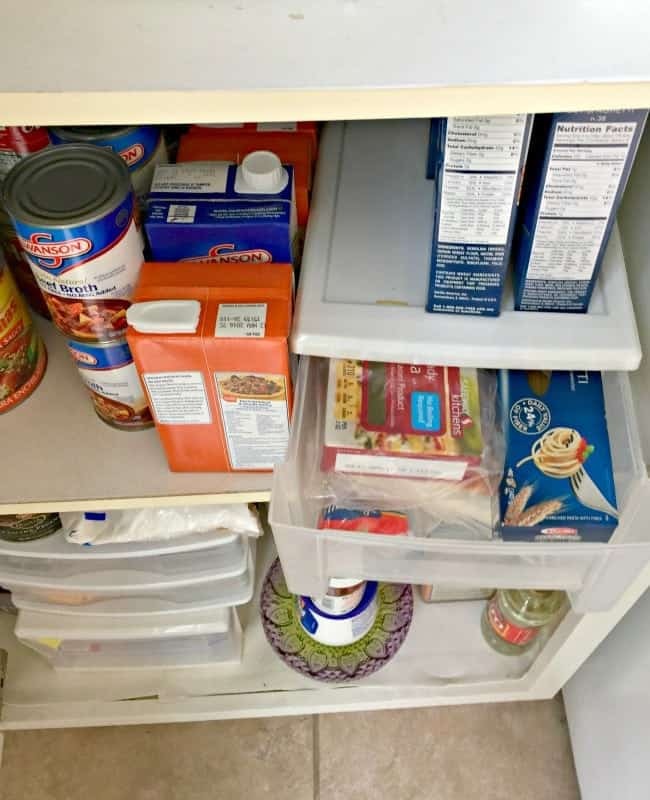 Refrigerator and Freezer Organization – tips to create storage and snack zones. Repurpose coffee cans – Easy ways to repurpose coffee cans for food storage with stylish coverings. Cookie Cutter Organization – A neat and tidy way to organize your cookie cutters. What are your favorite kitchen storage tips? 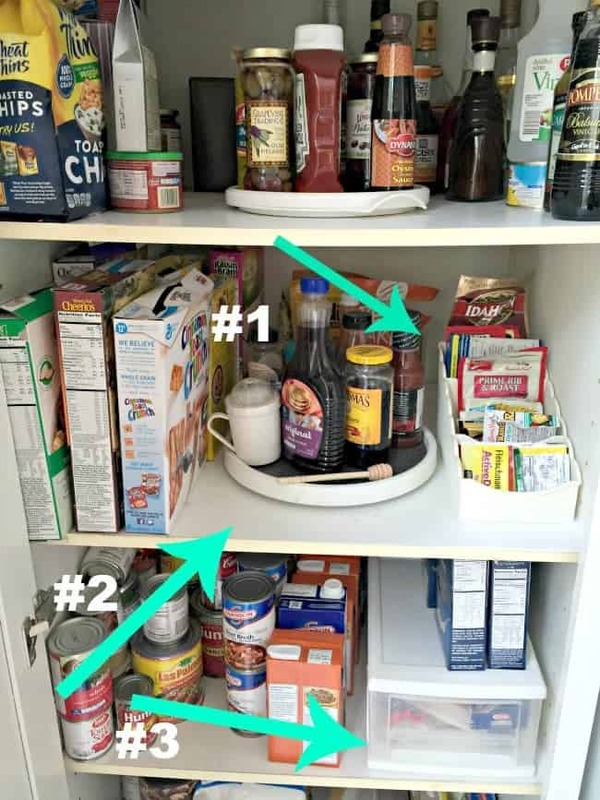 I need to reorganize the pantry again, so this is great! It always feels so good to organize it! Wasted space drives me crazy! I’m glad you addressed that. When we moved in there was a linen closet in the bathroom, as well as one outside the bathroom and near the kitchen. We couldn’t believe the people living here had two linen closets and not one food pantry! So we made it a very fine food pantry! Cassidy said it was one of my finer ideas.